I read this article and found it very interesting, thought it might be something for you. 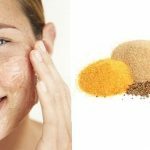 The article is called Homemade Face Scrubs and is located at https://homemademasks.net/beauty-blog/homemade-facial-scrub/. If you want a facial scrub, but do not want to spend a lot of money here’s a suggestion: you can prepare a very effective facial scrub, yourself. All you need is some cornmeal. It’s cheap, it can be ready in just a few minutes and it will gently clean your complexion. I must mention that cornmeal shouldn’t be confused with cornstarch (the white colored flour). It has a more grainy texture than cornstarch and is yellow in color. l be able to easily remove the dead cells without irritating it. This type of facial scrub can work wonders for oily skin. The interesting thing about corn meal is that it absorbs the excess sebum without drying your face. However it can be equally used on any skin type. The important detail is what you could combine it with, in order to mix the perfect facial scrub that will suit your needs. If you need hydration, you could combine it with honey, for easily irritated and sensitive skin it works being combined with some chamomile tea and for oily skin a suitable ingredient is lemon. There are also many other ingredients that can be successfully mixed with corn meal for obtaining a great facial scrub. Apart from removing impurities and dead skin cells it leaves your face feeling smooth and clean. Cornmeal also contains both Vitamin C and vitamin A which help maintain healthy and beautiful skin.